Ah, Windstar Cruises. Who doesn’t love a line so passionate about its cuisine? As Windstar zeros in even further on upping its gastronomic excellence, expect more high-five–worthy changes this year. Check out how quality and quantity make a marvelous match aboard this small-ship fleet. Candles puts a spell on you. How romantic to dine outdoors amid wafting sea breezes under a night sky ablaze with stars. The inspired twists of this coastal seafood and steakhouse menu add to the evening’s charms. Take a beef carpaccio starter; instead of the typical raw presentation, the chef sears the beef and then presents it with toasted hazelnuts, fragrant fennel, and sweet shallot dressing. 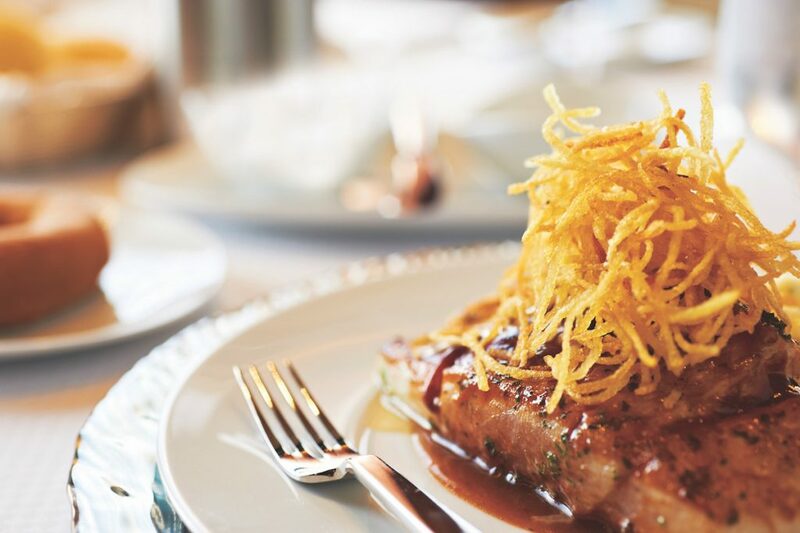 For entrées, consider the 10-ounce bone-in prime veal chop a sure bet. Same goes for the Angus New York strip loin, so tender it cuts with a mere touch of a knife. The grilled fish of the day, purchased at local markets by the executive chef, proves irresistible. The regional seafood is inevitably simply garnished — fish this fresh needs little enhancement. Sides include broccolini with crispy lemon crumbs, herbed quinoa, and deliciously cheesy potatoes roasted with prosciutto and Parmesan that make me sigh and Candles soar. Sauces such as béarnaise, so pointedly tarragon-scented, and a velvety textured cabernet reduction, would make any steakhouse proud. The buzz is that Candles’ menu will undergo changes as the year unfolds. Someone please tell me the delicious, lofty four-layer red velvet cake for two will stay on the menu! Windstar is now the official cruise line of the James Beard Foundation — and if you’re not a diehard foodie, what does that mean to you? The passing of James Beard, a champion of American cuisine who helped educate and mentor generations of chefs and food enthusiasts, prompted the esteemed organization’s founding. Among its programs, JBF presents food industry awards as coveted by chefs as the Oscars are by film stars. Windstar aligning with JBF is quite the accomplishment. JBF award-winners create dishes that are served on ship menus while onboard chefs demonstrate the top toques’ recipes so passengers can replicate them at home. JBF’s famous faces sometimes come on board to host culinary cruises, demonstrating recipes and preparing signature dishes from locally sourced ingredients for evening menus. AmphorA, Windstar’s main dining room, cleverly walks a fine culinary line by offering people-pleasers such as shrimp cocktail and baked lasagna Bolognese, but also showcases more sophisticated plates such as watermelon, spinach, and Greek feta salad with black sesame seeds and balsamic syrup, or salt-roasted red beet risotto with shaved fennel and horseradish cream. The James Beard Foundation award-winning chefs stamp an indelible print on menus. Food devotees who watch Top Chef and other culinary shows will recognize many names. Look for stunners by Louisville, Kentucky’s Decca chef Annie Pettry, who often….